they generally do not look particularly attractive in the picture as taken. by making some software adjustments such as enhancing the contrast. This section will guide you through basic image-processing techniques employed for images of nebulae and galaxies shot using telephoto lenses and telescopes. We will also cover methods of creating time-lapse movies by using the D810A’s time-lapse and interval timer photography functions, both of which enable you to express the dramatic movement of the stars. The light from nebulae and galaxies in the night sky is so faint that, when captured, they generally do not look particularly attractive in the picture as taken. 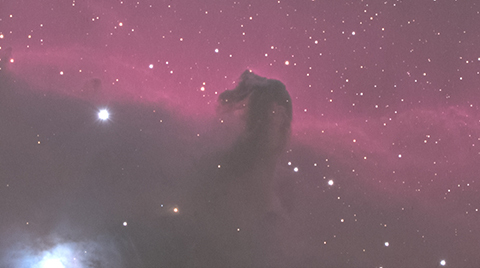 In the field of astrophotography, it is a common practice to finish these images by making some software adjustments such as enhancing the contrast. 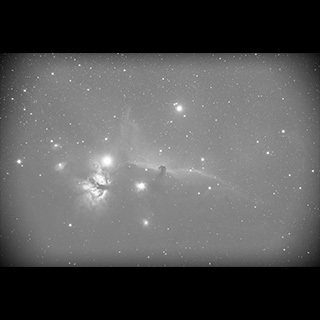 * Special image-processing software for astrophotography is required to perform dark-frame subtraction or flat-field correction. Also, images need to be shot in RAW data format. * As of June 2015, major astrophotography image-processing software does not support RAW image data shot with the D810A. Please contact each software company for support plans. 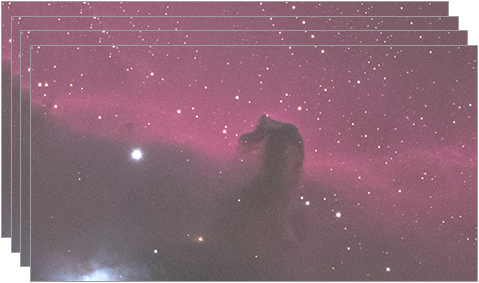 In contrast to daytime shooting where there is abundant light, astrophotography exposes the faint light from astronomical subjects with a long exposure time, making 'dark noise' such as long-exposure noise within the frame very apparent. 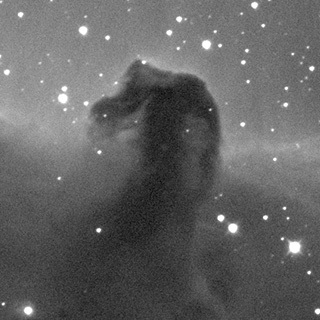 Usually, such effects can be reduced using the camera's noise-reduction function, however, this also requires the same amount of time as the actual exposure, making it impractical for astrophotography, where each frame is exposed for a long duration and a large number of frames is shot in a single shooting. Dark-frame subtraction in post-processing using a PC has become a common practice for reducing dark noise for this reason. The dark frame itself is usually composed from multiple frames (in a process called compositing) so that its S/N (signal-to-noise ratio) is increased. For example, the same number of ‘dark’ images as the actual shots can be used to compose a single dark frame. 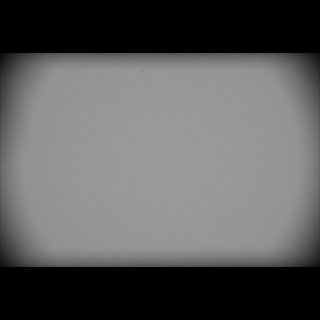 The dark frame exhibits the same noise distribution as your intended shot, therefore, subtracting this information from the image frame results in reduced fixed-pattern noise. ・Images captured with a cooled-CCD camera are used to illustrate the effect of dark-frame subtraction clearly. In daylight photography for subjects such as landscapes, shooting at open aperture often results in peripheral light fall-off* especially at the corners of the frame. This effect is noticeable when a fast lens is used at open aperture, and can be reduced to a certain extent by stopping down. In astrophotography, photographic lenses are normally used at the full aperture as the light from galaxies and nebulae is so faint, and telescope systems cannot be stopped down because they are not usually equipped with an aperture mechanism. Some lenses or telescopes do not exhibit apparent peripheral light fall-off, but in most other cases flat-field correction is performed to compensate for this effect in post-processing using a PC. 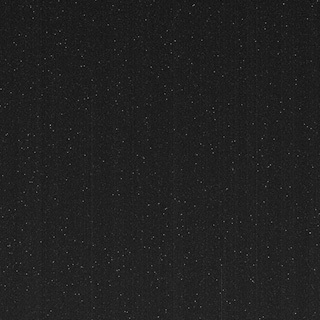 *Also referred to as ‘peripheral darkening’ in astrophotography. 1. Preparing images for a flat frame Position the same optical system that you will use for the actual shooting toward the sky at twilight, placing a piece of tracing paper or milky acrylic plate in front of the lens or hood to allow uniformly diffused light to enter the lens. Take several shots with the same settings (focus, shutter speed, aperture and ISO sensitivity) as the actual shooting. Note: An exposure time of more than a few seconds is recommended as underexposed images do not help achieve high precision in flat-field correction. Adjust the exposure time while referring to the brightness of the screen, so that the peak of the histogram in exposure preview is displayed near the left edge. 3. Creating dark frames for dark-frame subtraction of flat frames Composite* the dark images prepared in step 2 to create dark frames for dark-frame subtraction of flat frames. * Refer to "Compositing." 4. Perform dark-frame subtraction for the original images of flat-frame images To reduce noise in flat-frame images, perform dark-frame subtraction for each of the original images of the flat-frame images using the dark-frame images created in step 3. 5. Composite original images of flat-frame images To increase the signal-to-noise ratio in flat-frame images, composite* the original images of flat-frame images to create flat-frame images for flat-field correction. * Refer to "Compositing." Flat-frame images contain the equivalent information on peripheral light fall-off to that of images taken in the actual shooting. By utilizing the flat-frame image information, flat-field correction can lower the degree of peripheral light fall-off in the images where this reduction occurs during the actual shooting. RAW images after receiving dark-frame subtraction and flat-field correction are monochromatic images in Bayer arrangement that require colorizing. However, this process does not compensate for the faintness of captured astronomical subjects. Moreover, simply enhancing contrast on each image only degrades them, resulting in rough and unsmooth gradation. Compositing is effective to avoid such problems because it creates a single frame with averaged noise that is tolerant to image processing, by accumulating information from multiple frames captured in the same composition. Compositing enhances the S/N (signal-to-noise ratio) of the integrated frame by additive synthesis of multiple images (usually more than four). Generally, compositing more frames results in a smoother image that is more tolerant to image processing. Alignment for precisely matching the images is crucial in multiple image compositing because misaligned images will only yield double images of stars, and no matter how much you try to maintain exactly the same composition, the positions of the stars may be noticeably misaligned when the image is enlarged. 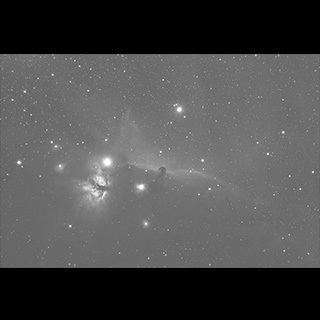 Many types of image-processing software designed for astrophotography are helpful because they almost completely automate this procedure. 1. Time-lapse photography function The D810A employs a time-lapse photography function which allows you to create time-lapse movies by simply setting intervals and total shooting time in the camera’s setting menu. No post-shoot processing is required (no extra image editing options are available). In addition, when the scene’s brightness gradually changes such as at dawn or twilight, the exposure smoothing function effectively reduces flicker effects during playback of time-lapse movies by enabling the option in auto exposure modes such as A mode. Total shooting time can be set up to 7 hours 59 minutes, for practicing up to 20 minutes of time-lapse movie recording.  Only movie file is recorded. No individual image files will be saved on the memory card.  Frame size/frame rate selected for Movie settings is adopted.  Time-lapse movie is recorded with an aspect ratio of 16:9. 2. Interval timer photography function When using the interval timer photography function, the camera automatically starts shooting still images with a preset starting time, interval and number of shots. Up to 9,999 consecutive frames can be captured, and an exposure smoothing option is also available. Images shot in interval timer photography can be rendered into a time-lapse movie by using software available on the market. If you select the Large image size in the FX format, the large pixel count (7360 x 4912) allows panning and zooming within the captured frame, as you render the images into a Full-HD (1920 x 1080) movie. You can also produce a time-lapse movie from RAW image shots after applying appropriate image processing to each frame.  Combining interval timer photography with use of an MC-36A Remote Cord enables shooting of an unlimited number of still images for as long as your memory card or battery life allow. In this case, the exposure smoothing function cannot be enabled.